The Magnetic Dipole Field Model displays the field lines and field vectors of a dipole located at the origin and oriented along the z-axis. Drag the yellow handle in the 3D view to compute the B field passing through a point (x,y,z). 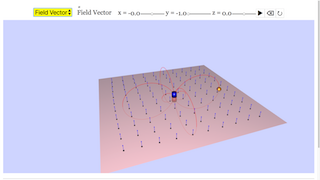 Select the field option to show the field vectors in plane that passes through the dipole. The Magnetic Dipole Field Model was developed by Wolfgang Christian using the Easy Java Simulations (EJS) modeling tool version 4.3. You can examine and modify the model for this simulation if you have Ejs installed by right-clicking within the program and selecting "Open Ejs Model" from the pop-up menu. Toggling the combo box will give you their respective options. Adjusting the x,y,z sliders will move the object to their respective coordinates. Plays/Pauses, erases and resets the simulation respectively. Clicking on the Erase Button will clear all the traces in the simulation.